Sorry for such a bad photos, but as we all know red is just about impossible to photograph and have it come across correctly. Though in my defense the photo up above was taken as MG was walking into the house minutes before she received her mittens. So it wasn't ideal lighting either. Snapdragon Flip Tops is an adorable pattern. 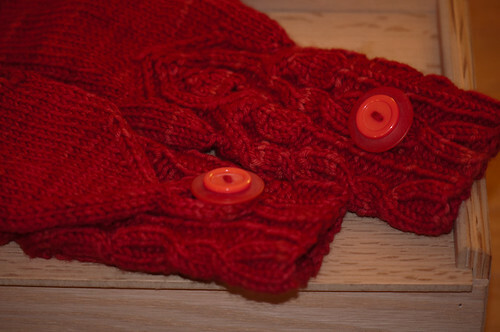 I lengthened the cabeling since I knew she wanted longer cuffs and I changed how the points of the mittens were done. While I was in London last week, I searched for two cool buttons at Liberty and Loop, but none were to bad had. So to finish it off , I went through my vintage button collection and found 2 sets of buttons to use on the cuffs. Sweet! Hope you had a yarnful Christmas! Awww.. what beautiful gloves! I hope you had a lovely Christmas!